Assignment 3 builds upon the multi-view navigation-style app idea, by adding coverage of recently-covered topics. While you are doing the work, if a specific task is not clear, or it seems to require an unreasonable amount of time to complete, contact your professor. We need an app that will work with data about Canada’s provinces and cities. 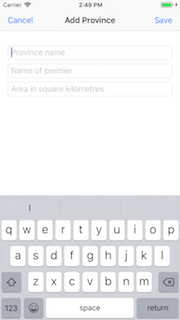 The app’s first scene is a list of provinces. The data model manager’s initializer code creates two provinces. Tapping on the + “add” (upper-right) button will modally present an “Add Province” scene. Back on the province list, tapping a province’s ⓘ detail accessory shows more detail. Alternatively, tapping elsewhere on the row will show the next scene, which is a list of cities in the tapped/selected province. There is a similar workflow for cities (in a province). We’ll discuss that later. Create a new single-view project named “Canada”. Set the iOS version for deployment at 11.0, and the active scheme for the desired emulated device etc. Run the app to prove that it works, before doing any changes. Then, as you make changes, build frequently to ensure there are no errors. Again, as noted above, read/skim the rest of this document before you begin work. That way you know what’s coming. Create two new data model classes. Follow the pattern of the existing “Product” class to code the properties and the initializer. Before continuing, write the initializers for each class. How do we “link” the two classes together? In a way that’s similar to other languages, and therefore should be familiar to you. A province can have a collection of cities. Looking the other way, a city belongs to a province. Add an array property, of type City, to the Province class. Its initial value is an empty array. Later, when we add City objects, they will be contained within a Province object. We should change the City class too. For safety and convenience, it is a good idea to know what province a city belongs to. We can do that by adding an integer property for the province identifier. Yes, we will have to maintain that actively and manually. (Later, when we use a persistence management system - such as a database - some of that work will be done by the system.) Update the City class initializer to require the province identifier. Save, build, and run, before continuing. The methods in the manager class assume the use of a “Product” class. In general, follow the pattern of the existing methods, and create new methods for the “Province” class. In the initializer, write code to add data for two (2) provinces. Wikipedia is a good source of information. Tip - Comment out the existing code. Then, copy and paste it, and edit the pasted code. The save and load methods need editing too. Remember from above, our focus is on the province collection. City objects will be contained within each province object, so we do not need a separate data storage file for cities. Later (soon), the appropriate code will be copied into the app delegate source code file. We’ll do that after the first controller is configured. Take the time now to write methods for the Province tasks. Maybe do this one method at a time, using a copy-paste and edit workflow. Later (soon), we will add more code to handle city-related tasks. 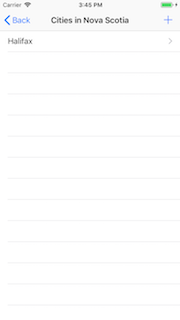 In the project navigator, delete the “ViewController.swift”. On the storyboard, delete the scene. Now, we can make the controller that shows a list of provinces. 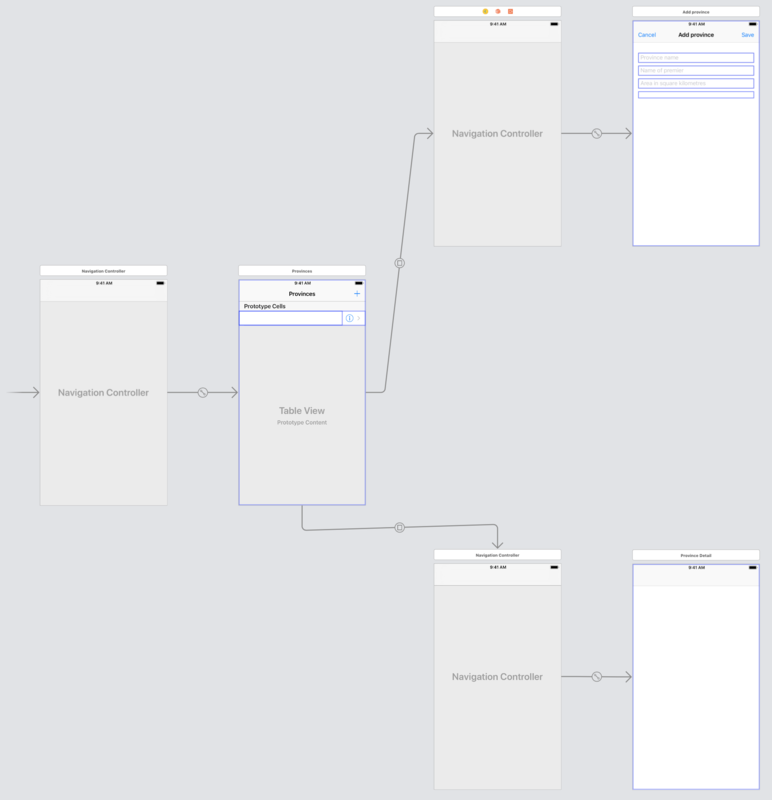 From the template, add the “ProductListBase.swift” source code file. Each controller source code file that is added from the template must be edited, to customize it to the current app and its data. Here is a general suggestion about how to make most of the edits. First, in the project navigator, rename the added file to better match the current app. For example, here, rename “ProductListBase.swift” to “ProvinceList.swift”. Next, open it for editing. We will do a find-replace. This feature is found on the “Find” menu (and it has a keyboard shortcut, Option+Command+F). Turn on (activate) its case sensitivity option (the Aa control). It will be blue-colored when activated. Now that the first controller has been added and configured, we must go back and ensure that the data model manager is initialized when the app loads for the first time. Located the commented-out code at the bottom of the DataModelManager.swift source code file. Select and copy the appropriate code. As its how-to instructions state, replace the existing stub method in the app delegate class with the copied code. You can decide whether to add the “save plist” statements to the appropriate methods now, or later. If you add the statements now, and load/save errors start to happen because of bad data or changes to the data structure, then you can delete the app from the simulator, and the app will re-create the data. 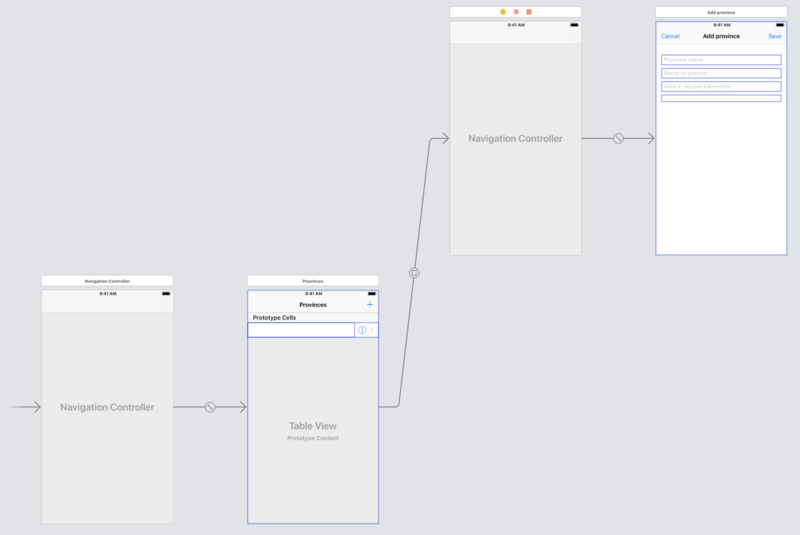 On the storyboard, add a table view controller. Set its class to the above “ProvinceList” class. Set the cell reuse identifier of the prototype table view cell (to match the value used in the ProvinceList class). Other properties can be set/configured now or later. Embed this scene in a navigation controller. Set the navigation controller as the initial view controller. Save, build, and run, before continuing. If all goes well, your app will show a list of two provinces. From the template, add the “ProductAdd.swift” source code file. Edit (product to province) as you did before. The Province data model class is obviously different from the templated Product class. As a result, you must do more edits, to match the app’s needs. Outlets, data validation, and calling the delegate method are the typical things that need edits. Notice the example method implementations at the bottom of the source code file. Copy those to the presenting controller class (ProvinceList), and ensure that the ProvinceList class adopts the AddProvinceDelegate protocol. While you’re still editing ProvinceList, activate (uncomment) the code that handles the “toProvinceAdd” segue. At this point, your storyboard may look something like the following. (Click the image, and any other storyboard image that follows, to open it full-size in a new tab/window.) Notice the add province scene in the upper-right area of the image. Save, build, and run, before continuing. The app should now enable the user to create new provinces. Let’s code the ability to see full details about a province. From the template, add the “ProductDetail.swift” source code file. Edit (product to province) as you did before. Similar to before, some edits are needed. Outlets, viewDidLoad(), and calling the delegate method are the typical things that need edits. Again, notice the example method implementations at the bottom of the source code file. Copy those to the presenting controller class (ProvinceList), and ensure that the ProvinceList class adopts the ShowProvinceDetailDelegate protocol. While you’re still editing ProvinceList, activate (uncomment) the code that handles the “toProvinceDetail” segue. Save, build, and run, before continuing. The app should now enable the user to view province detail. Province-related work (list, add, detail) is mostly done. Now, we will do similar work for cities. 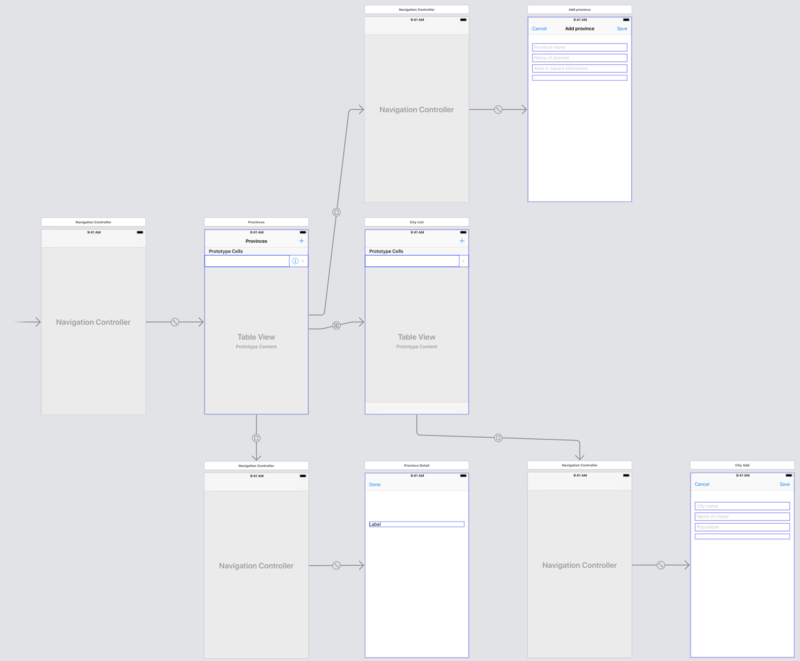 The work done to assemble this nav flow will be similar to what you just did with provinces. The difference is the data. When we are working with a list of cities, it is a collection of City objects located in a specific Province object. We must ensure that the data model manager methods accommodate this difference. Tip - Draw a simple diagram that shows the containment or nesting of a small collection of city objects inside a province object. That will help you visualize the data storage scheme. And it will help you plan to write code. We do not change the existing initializer, load, and save methods. They are good as-is. Notice that all of these requests are “for a specific province”? That means that ALL these methods MUST have another argument that accepts the province identifier. Then, in the method body, the identifier will typically be used to fetch the province object, before doing the main task (fetch city/cities, sort, add). Don’t forget this - all the city-related methods need an argument that accepts the province identifier. Here’s some guidance for specific methods. Fetch the desired province object. The return function does its work (reduce) on the cities collection of the province object. Consider wrapping this logic in an if-let statement. Again, consider wrapping this logic in an if-let statement. If good, finish configuring the new city item object. Save it to the provinces collection of cities. Return the just-added city object. Again, if-let… (if it fails, return an empty array). The return function does its work (sorted) on the cities collection of the province object. Remember, this will appear when a province is tapped/selected. The ProvinceList controller will pass on the province object to a new CityList controller. The CityList controller will render/display the contents of the province object’s cities property, which is an array of zero or more city objects. Change the other code (including the code in the tableView(_:cellForRowAt:) method) to work properly. This city list controller will support two segues. One will be a next/workflow segue, and the other will be an add segue. Add those segue handlers now too. 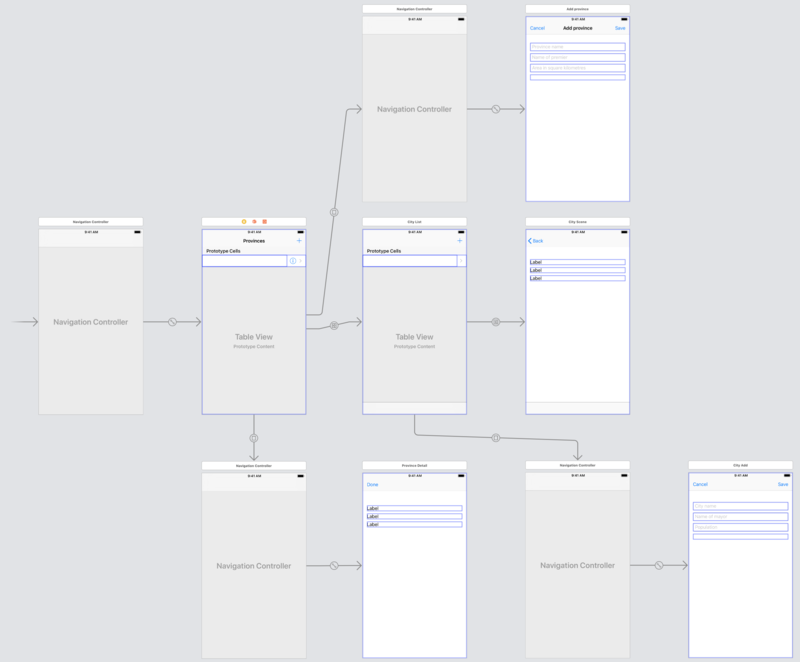 On the storyboard, add a table view controller/scene, and set its identity. Set its prototype cell to have a disclosure accessory, and set its reuse identifier. 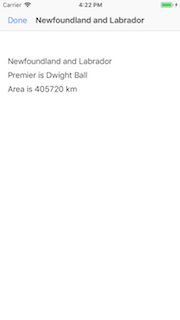 Make a segue from the prototype cell in the province list scene to this new city list scene. It is a “Selection Segue”, “Show”. Save, build, and run, before continuing. The app should now enable the user to tap/select a province, and navigate to an empty list of cities (for that province). From the template, add the “ProductAdd.swift” source code file. Edit (product to city) as you did before. Remember to adopt the “add city” protocol in the city list controller, and copy-paste the example method implementations. While you’re still editing CityList, activate (uncomment) the code that handles the “toCityAdd” segue. At this point, your storyboard may look something like the following. Notice the city list scene (in the middle) with the + bar button item. Notice also its segue to the “add city” scene in the lower-right area of the image. Save, build, and run, before continuing. The app should now enable the user to add a new city (for a specific province). The last feature is to support a user tapping/selecting a row on the city list, and navigating to a standard view that shows the city’s information. 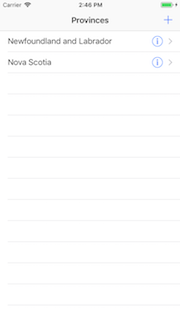 From the template, add the “ProductSceneBase.swift” source code file. Edit (product to city) as you did before, and the other typical things (outlets etc.). In CityList, activate (uncomment) the code that handles the “toCityScene” segue. At this point, your storyboard may look something like the following. Notice the new city info scene (in the middle-right area of the image). Save, build, and run, before continuing. 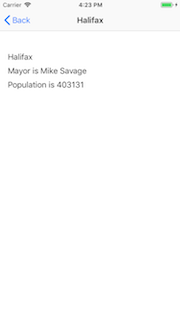 The app should now enable the user to view info about a city. Test your work by running it on the simulator. Do this frequently and incrementally, after making any substantial changes. Use the debug tool when it’s useful to do so. Locate your project folder in Finder (and we suggest that you make a copy of it for yourself). In that folder, add a new folder named “MyCode”. For each of these files, change the file name extension to “txt”. Right-click the folder, and choose Compress “xxxxxxxx”, which creates a zip file. Login to Blackboard/My.Seneca, and in this course’s Assignments area, look for the upload link, and submit your work there.